Name Idea: In commemoration of Australia’s first Governor, Captain Arthur Phillip. Colours: Blue and gold – colours of the city of Canberra. House Flag: Blue to mast with lymphad emblem; gold trailing. Flag is pennant shape. Arms: Crown, sceptre, sword ~ traditional symbols of authority brought to Australia by Capt. Phillip; also on the Canberra City arms. Lymphad (the heraldic symbol of an ancient galley which carried soldiers and slaves) ~ symbol of the First Fleet. 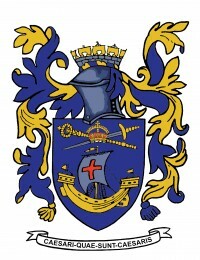 Three lymphads (ships) are quartered on the McDougall arms. Fr McDougall was the founding Provincial of the Australian Province of the Missionaries of the Sacred Heart. The lymphad, with set flags and pennant flying as symbols on on-going victory, flanked by two swords, was the design of Daramalan’s original College badge. The lymphad represented the ‘Ship of Faith guarded by Swordsmen’ ~ FORTES in FIDE. Crest: Royal Navy Crown – tradional. Phillip was a naval Captain.